This past Sunday one of the things we talked about are ways we practice remembering and noticing the presence of God every day. This practice is foundational for a growing faith life. God is a deep mystery, at the same time closer than the closest friend, and so much more. We don’t come to a perfect relationship with God all at once; that relationship is a lifetime work. God is with us, eager to deepen our experience and trust. Daily practices are simple ways to do our part. They help us get below thinking about God and into the habit of feeling God’s presence always. Every morning, as you rise from bed, say out loud the words of the psalm “This is the day that the Lord has made, let us rejoice and be glad in it. Set aside, in advance, one meal per week that you’ll eat in holy silence—no conversation, no TV, radio, computer, phone, no reading the paper—only full concentration on the blessing of the meal you are eating: noticing the taste and texture, remembering that all we have is God’s gift, offering thanks with each bite. If you try any of these, let me know how it goes. I’ll just confess up front that I try all kinds of faith practices. Some of them I maintain well for years, others never quite take hold in my life, often my practices are spotty. It’s all good. No need to worry about feeling guilty. Just try something. God’s grace will find its way though even the smallest cracks in our too self-centered ways. Indeed, God is already closer to you than your own skin. Those gathering for 4oh!4 in the basement of the Condon United Church of Christ on Sunday afternoon at 4:04 p.m. will share a simple meal of soup and experience the labyrinth. 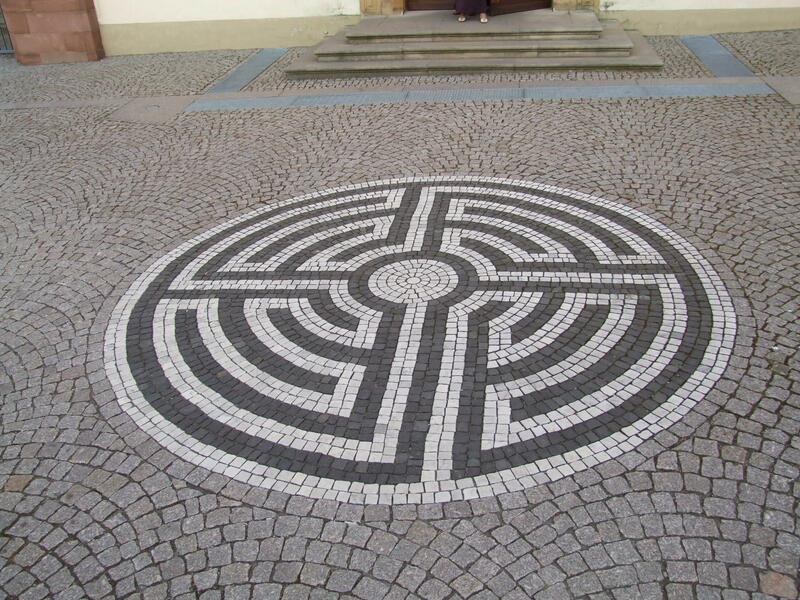 Sometimes confused with a maze, a labyrinth is an ancient symbol that relates to wholeness. It combines the imagery of the circle and the spiral into a meandering but purposeful path. The Labyrinth represents a journey to our own center and back again out into the world. Labyrinths have long been used as meditation and prayer tools in various faith traditions. Unlike a maze, with a labyrinth there is only one choice to be made. The choice is to enter or not. A more passive, receptive mindset is needed. The choice is whether or not to walk a spiritual path. Our sacred text this week comes from the gospel of Matthew. Matthew 4:1-17 is the story of Jesus being tempted prior to the start of his ministry. Traditionally we have thought of the tempter as an evil character or even Satan but that is not quite correct. You can read the scripture in the Common English Bible or in your favorite translation. I will be pairing the scripture with a wisdom text in the coming weeks. The wisdom text for this week is an excerpt from Rev. Dr. Martin Luther King, Jr.’s “I Have a Dream” speech. You can read it at the National Archives by clicking here or watch a video from Salt Project. 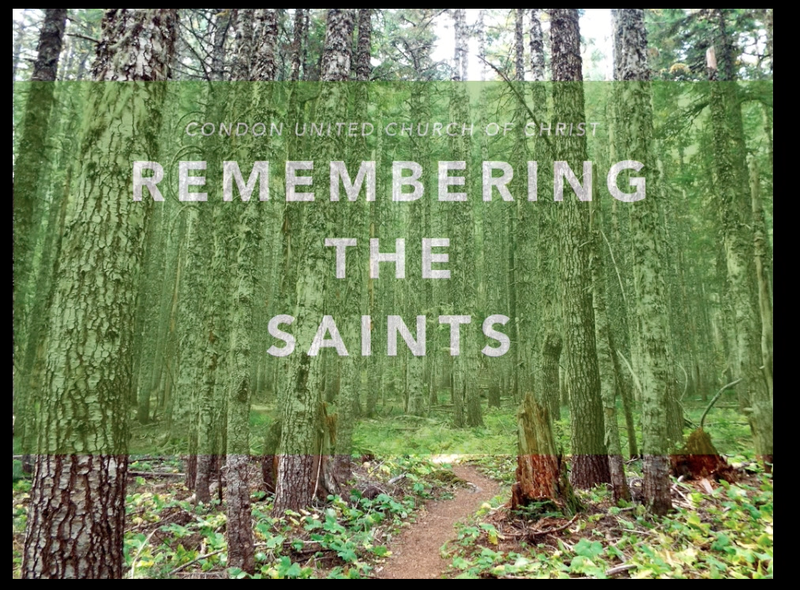 The Condon United Church of Christ announced special music, weekly worship, Bible Study, and special services for Advent, the start of the Christian calendar and the season of preparation leading to Christmas. The focus of services and studies will be “Searching”, according to Rev. Tim Graves, pastor of the United Church of Christ. Advent at the UCC begins Sunday, November 30 with a Hanging of the Greens worship service featuring special music by local artist and musician Dan Robinson. Scripture readings, Advent and Christmas hymns, prayer, and multimedia are interspersed with decorating the sanctuary. “At the start of a Hanging of the Greens service, the sanctuary is bare. By the end of the service it is decked out in seasonal decorations and liturgical colors,” said Rev. Graves. Each Sunday morning, as is the practice at the local UCC, begins with Bible study at 9:15 and worship at 10:30. 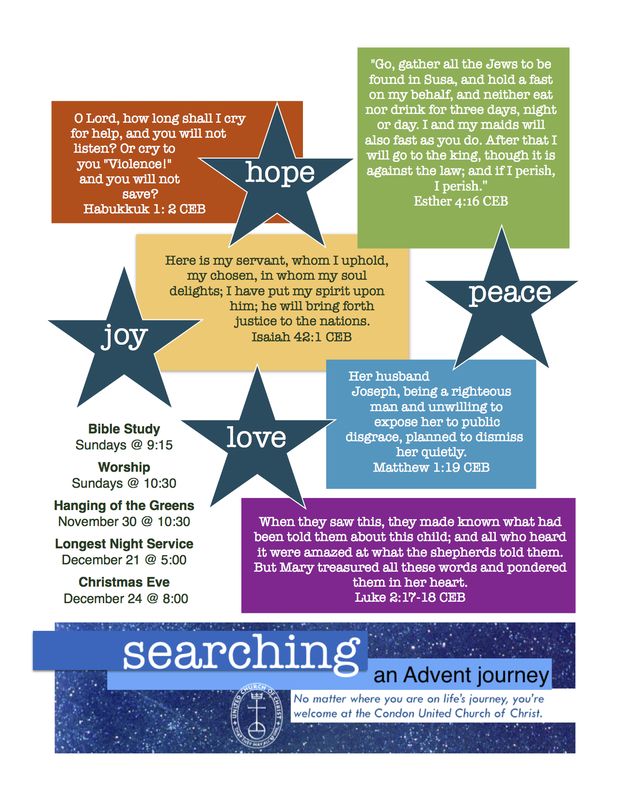 The traditional themes of hope, peace, joy, and love will be incorporated into the searching theme on each of the four Sundays leading to Christmas. The second Sunday of Advent, December 6, will feature special music by Russell Thompson, grandson of Patti and Dale Thompson. A Longest Night service will be Sunday evening December 21 at 5:00 p.m. Sometimes called Blue Christmas, many Christian churches now recognize the sadness inherent in the Christmas season for many people. The traditional candlelight Christmas Eve service will be at 8:00 p.m. on December 24.
of the saints of our lives on this All Saints Sunday. We learned from them in easy ways and hard ways. We remember the One who journeyed with each of them. We focus now on the One who journeys with us still.